use when registering your kids. 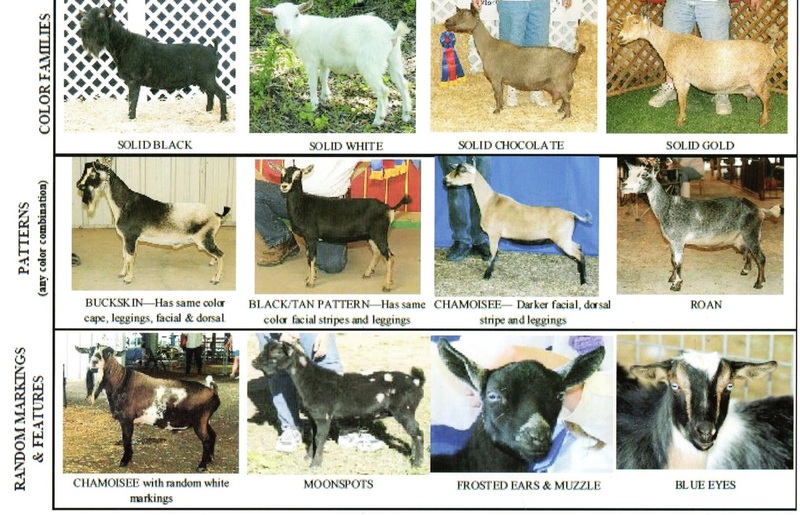 There are many different color variations in the Nigerian Goat. These are the base colors and patterns. If you have a kid that has allot of white spots with a base of one of the below patterns you would call that variety Broken which means the Buckskin, Chamoisee, or black and tan pattern is broken up with white spots. If there are moonspots, add with moonspots, on the end of the description. If they have blue eyes, put that on there. Normal eye color is variations of yellow. Please try to keep the color/pattern description simple with as few a words as possible so it fits on the registration papers. some of the other members will help you.